I’ll be a little evasive again, but for a purpose: although digital media mean everything now, vinyl pressings have never been so good and there have never been so many turntables, cartridges, etc. By saying this, he confirmed the opinions of my other interlocutors (more HERE). Apparently, they were right – we can see that the position of file players on the market is becoming stronger and stronger, whereas the market share of physical formats (with the exception of vinyl) is decreasing. Last year, during the High End 2014 exhibition I talked to a lot of exhibitors and what they were saying was a little different. All of them are aware of the revolution that has actually already taken place, i.e. of the presence of files and streaming as the mainstream sound source. However, many of them are now starting to use Compact Discs and Super Audio CDs with relief again (while they have never forgotten about vinyl). In this way, they are suggesting that we are losing something important when we stop using these formats. Nevertheless, they think that for NOW the most important challenge facing the audio industry is to take control of the acoustics of listening rooms. The problem is as old as the audio industry itself and, despite the fact that so many years have passed, acoustics still remains the least explored part of the audiophile universe. However, as digital signal transfer became widely used and a lot of money was invested in digital processing, new possibilities emerged. They were mainly used by manufacturers of sophisticated home theater systems – auto-calibration is now one of the basic sound improvement tools used in AV processors and AV receivers (and also subwoofers). Similar systems, often more advanced ones, are offered by a few high-end stereo equipment manufacturers, including Accuphase. 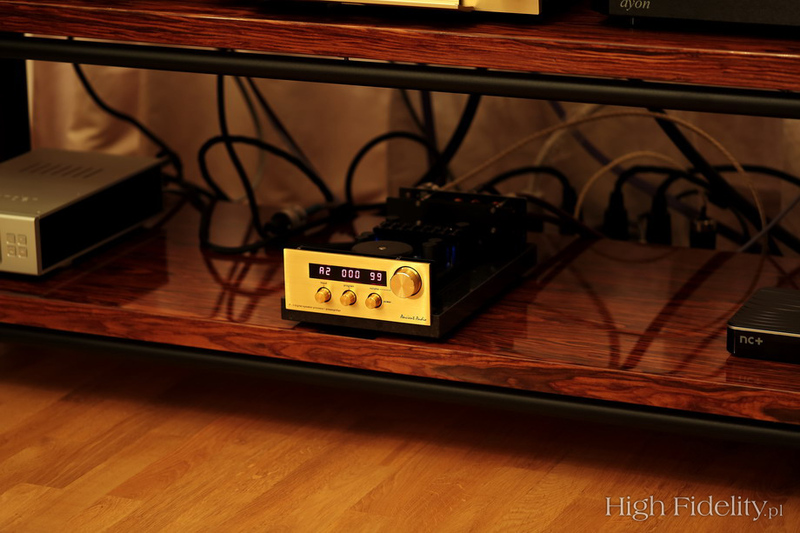 An account of a meeting connected with the Accuphase DG-58 Digital Voicing Equalizer was published in the November issue of “High Fidelity” (No. 127, November 2014, read HERE), whereas “Gazeta Wyborcza” (a Polish newspaper) published its own article related to the event (more HERE). The product performance was unambiguously effective and was accepted as a step forward by all the participants. Not that there were no “personal losses” – it is simply impossible, but the opinions were unanimously positive. The correction of room influence on sound quality is one of a few ways of using the incredible computing power of DSP circuits that have never been so cheap before. Another possibility is processing signal in a way which makes it possible to minimize errors contributed by individual elements of the audio system, most often by converters and speakers. Thanks to proper processing of digital signal (“post-processing”) devices such as the all-in-one Naim Mu-so system sound so incredibly well. Its constructors tried to correct the imperfections of converters and their arrangement, as well as of amplifiers and files themselves by using digital signal processing. Such a correction can also be made in the analogue domain. However, if it is to be really effective, it has to be dedicated to a specific product and it will have a limited range. It can have excellent effects, like in the case of the Studio Oslo and Master Oslo speakers. These tiny speakers sound simply fantastic, contrary to almost every component – the size, power and number of converters. However, active columns from the Oslo series were something more – they became the starting point for a project which was called “P” by Jarek Waszczyszyn, the owner of Ancient Audio. It is all about a digital processor, the function of which is to correct the imperfections of converters and speakers in the digital domain. Its third version, called the P-3, was presented during the Audio Show 2014 exhibition and it had just been a matter of time until we decided to have a look at it within the Krakow Sonic Society. The meeting that we devoted to the P-3 was very interesting in the sense that it was held at exactly the same place at which we earlier tested the Accuphase DG-58. We also used the same system for testing. The device was also placed in an analogue path, between an Ayon Audio converter and preamplifier, exactly in the same way as the DG-58 before. Initially, I planned to insert the P-3 into a digital path, between the drive and converter, but the constructor had not anticipated such a possibility. At the moment, the processor has a few digital inputs, including USB, balanced and unbalanced analogue inputs, as well as balanced and unbalanced analogue outputs. 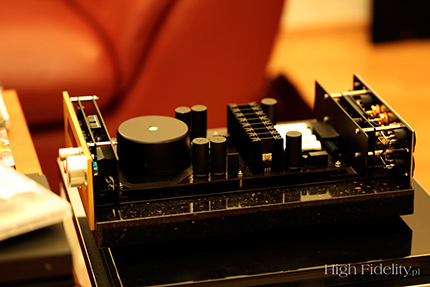 It also has an adjustable output level, so it can function as a classic DAC. Actually, its arrangement is exactly the same as the one in my Lektor AIR, except for the fact that transistors are used here instead of tubes. However, the output coupling capacitors are the same fantastic V-Cap capacitors. We have to remember that it is not the first product of this type. At the High End 2014 exhibition in Munich, the French company Devialet presented a new line of hybrid, analogue-digital amplifiers. One of their most important properties were the SAM Processing (Speaker Active Matching) algorithms that correct the imperfections of speakers. Initially, data on a few dozen speaker models was stored in the device memory. Now there is probably data on a few hundred models and the number is still growing (more information on the technology is available HERE). In the case of the P-3, general data is pre-programmed in the device memory, whereas final settings are adjusted in the client’s system. Jarek Waszczyszyn does it himself and calls the whole process “seasoning”. So, he is the best person to tell us what the P-3 is and what it is not, as well as to talk about the ideas behind it. 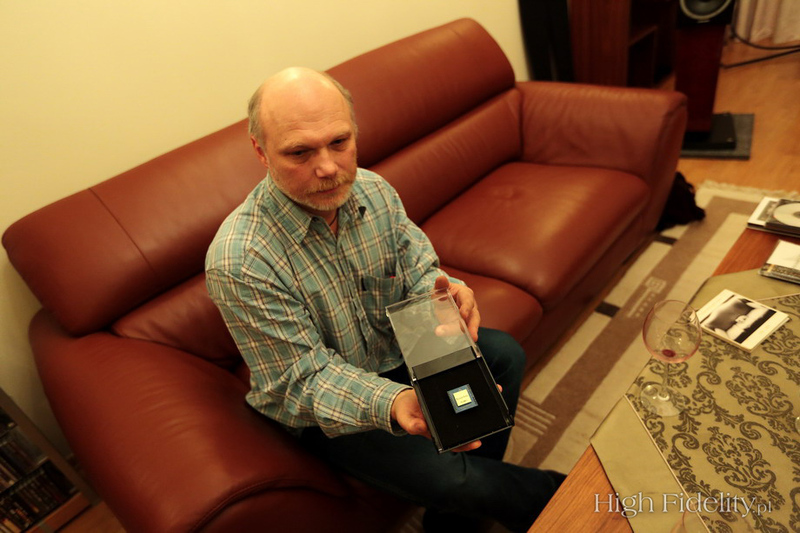 Jarek Waszczyszyn with the DSP P-3 in a box resembling a jewelry or a watch box. Later we had some fun and Justyna, the mistress of the house, presented it in a similar way. Both audiophiles-beginners and those who have listened to music from numerous (tube) devices all agree that a speaker is something that determines the sound of the whole audio system. It is the speaker (or the speaker set, to be more precise) where the most complex phenomena occur. A vast majority of speakers operate dynamically, based on the movement of a conductor in an electric field. The electrical aspect of their operation, i.e. the conversion of electric current into mechanical force has already been mastered and physical models are successfully used in the process of electric engines design. The second stage, i.e. the conversion of the conductor movement into a sound wave is definitely much more complicated. For low frequencies (when the dimensions are smaller than the length of the sound wave) it is fairly simple. The classic Thiele-Small (T-S) model is sufficient and it is successfully used by all speaker manufacturers and constructors. It all becomes more difficult at higher frequencies, when the size of the speaker’s membrane and its casing are similar or larger than the sound wave length. In this case, unwanted mechanical phenomena occur, both in the speaker itself and in its casing. Even the most rigid membranes (ceramics, diamond) bend and the most robust casings resonate. As a result, artificial resonances, delays and sound wave distortions occur. 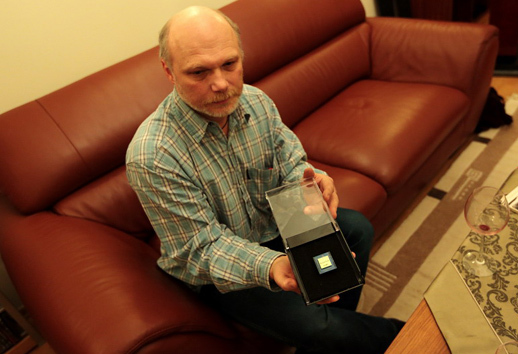 The processor is called the P-3 because it is its third version. The previous versions are shown in the photo. Constructors have been trying to overcome these phenomena for many years. Those who design speakers, apply sophisticated mechanics – exotic materials and elaborate geometry. Speaker constructors use electrical correction with the use of complex crossovers. A good example of that are classic Thiel speakers: their first-order crossovers consisted of even a few dozen elements. These techniques only made it possible to partly solve the problem, causing new problems. Digital technology has proved to be the solution to these problems. The correction of mechanics through digital signal processing has had excellent effects in industrial processes, motorization and aviation. It is so effective that a user most often does not realize it is being applied. Pressing the accelerator pedal used to open the throttle in a car’s carburetor. Today, air intake is controlled by a stepper motor, whereas fuel is supplied by computer-controlled injectors. The accelerator pedal only supplies information to the computer, while the user can enjoy the full comfort of driving. The basis is an appropriate engine model and the algorithm which controls it. The beginnings of digital speaker correction date back to the 1980s and are connected with the emergence of DSP (Digital Signal Processor) circuits. Most of these devices, e.g. the Accuphase DG-58, operate on the basis of speaker characteristics measurement and then create reverse characteristics. This method is quite safe, but at the same time limited – it does not address the real sources of problems. The inside of the P-3 has been prepared in such a way that it is possible to admire it without the upper panel, just like a tube device. My device attempts to solve the problem differently. It all starts when a theoretical model of a speaker is created. It takes a lot of parameters into account, including the size of the speakers’ membranes, the material they are made of, dumping, the reflection of sound wave from the casing panels and casing resonances. These phenomena are modeled using a unique algorithm, which is performed in real time by the speaker processor. Everything is packed in a neat silicon dice – the digital P-3 MK I sound processor. Developing my own circuit was essential, as all available signal processors did not have all the necessary functions. An important issue are the settings (parameters) of the algorithm. They have to be different for every speaker model. In the case of simple constructions, it is enough to conduct a series of measurements and take some simple steps according to the tuning procedure to set them. However, the best speakers require a “final cut” based on musical material. The base of ready-made settings is growing systematically: at the moment it includes Sonus Faber, Avantgarde Acoustic, JBL, Spendor, Raidho and Wilson Audio speakers. The processor resembles a C/A converter a little. On the one hand, it is a tiny silicon plate which needs to be surrounded with a power supply, an analogue stage, an interface, clocks, etc. It is similar with the P-3. The processor itself operates on the basis of digital data only – that is why it is easiest to install it in a CD player between the transport and converter – all Lektor player owners can do that. However, it is not a universal solution. The external universal device which operates as a typical preamplifier, requires an A/C and a C/A converter, a power supply, a casing, control, etc. 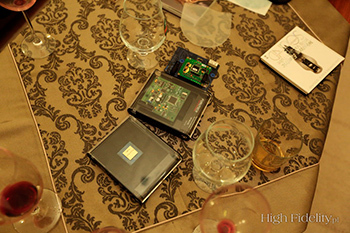 That comprised the whole system from which we listened to music during our meeting – preamplifier/the P-3 speaker processor. The P-3 can also be installed directly in Lektor players. The price of such a change is 8000 PLN. A Lektor player can also be equipped with a processor and an A/C converter – such an upgrade costs 10 000 PLN. In such a case, it is also possible to connect analogue sources (a cassette deck, a turntable, a tuner, etc.) to the player. The P-3 can also be installed in other players (e.g. Ayon). The P-3 circuit installed in the Lektor Prime player. It can be installed in all Lektor and Ayon Audio players. To have a realistic picture of what the device brings into a system, it was installed in the system in a balanced path between the Ayon Audio Stratos DAC/preamplifier and the Accuphase A-70 power amplifier. The Ayon device has balanced and non-balanced outputs that are changed using a switch, and the Accuphase power amplifier has inputs of both the types, also changed using a switch. So, the system was as follows: we connected the Ayon output to the power amplifier using a single balanced interconnect (that was our point of reference – this is how the system normally works) and we set up a parallel connection between the unbalanced Ayon output and the P-3 input (using the same interconnect as in the case of a direct connection, but in the RCA version). We sent signal from the P-3 to the unbalanced Accuphase input using an additional interconnect. When making a comparison, it was enough to simultaneously switch the Ayon output and the power amplifier input. Levels were equalized thanks to analogue control in the P-3. The listening session consisted of a few stages. During the first stage we compared the system with the P-3 switched on and without the P-3, using an A/B/A comparison, with unknown A and B (i.e. we did not know in which position the processor was in the path and in which it was not), using 2-minute long samples of musical works. After this stage participants voted for A or B, depending on which sound version they liked better, and I collected their opinions. During the second stage we listened to whole musical works (knowing A and B). Finally, we listened to many musical pieces, without any discipline, just as we wanted. 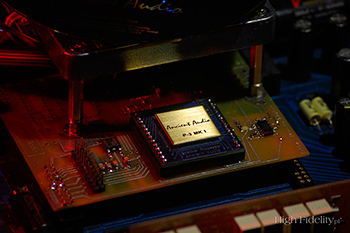 The influence of the processor on sound is dramatic – it is hard to find another word. However, it was also not unambiguously positive. What is more, opinions changed with time, i.e. the more we got used to the sound of the system with the processor, the more willingly we would give it the first prize. However, since it was not a sound test of the “everything is fantastic” type, I will begin with the last stage, i.e. with participants’ opinions collected a few days after the meeting. It is true that good devices seem average at first and only later, after we have been using them for a longer time, allow us to discover something that lies deeper in them. Is it the same in the case of the P-3? Time will show. The changes that I heard with the processor were undeniable – there was a change of tone, purification, smoothing, but at the cost of dynamics, focus and the so-called “claw”. That is why in the case of rock recordings in which the electric guitar was dominant, the processor had an overall negative effect on the whole. In my opinion, it literally shattered (destroyed) the piece. It was so both in the case of Queen and Perfekt. However, when we listened to classical music or to calm California Dreamin’, things became more complicated. For me, the verdict was not so obvious anymore. Dynamics was not the most important thing here, so I spent a lot of time thinking whether the sound given by the processor was better for me or not. I was not sure about my verdict and perhaps the way I voted at the beginning of the listening session was influenced too much by what I heard when we listened to Queen? Anyway, the fact is that when I listened to a few other musical pieces with the processor, its sound was becoming more and more pleasant.